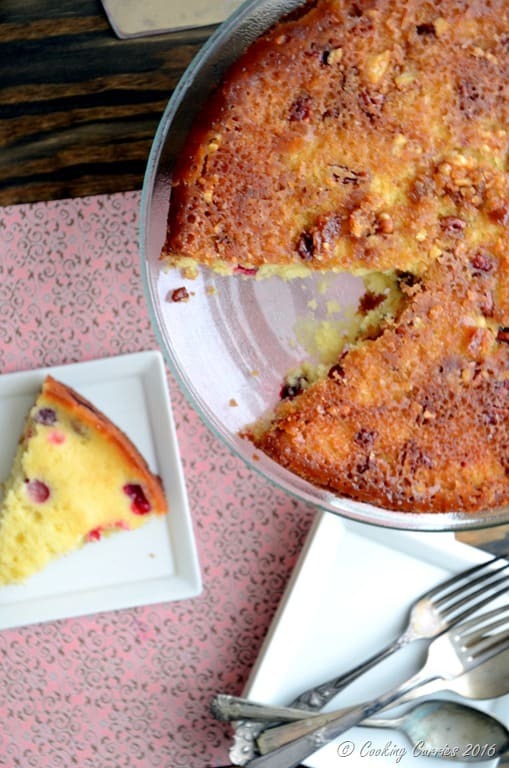 The tartness of the cranberry, the sugary buttery -ness of the glaze and the spongy cake in the middle of that, this Cranberry Upside Down Cake is one heavenly dessert for Thanksgiving! And finally, I made the Cranberry Upside Down Cake and it did not drip down the sides of the pan and start smoking in the oven!! Yes, that is what happened last year when I tried to make it. The recipe called for a 9 inch pan and that did not work at all! This time around, I changed the recipe around and used a larger pan. The cake turned out to be really good, but I definitely see some areas of improvement. Need to work on the butter-sugar ratio for the glaze and maybe work on the egg ratio as well. But don’t get me wrong here, this cake tastes delicious! 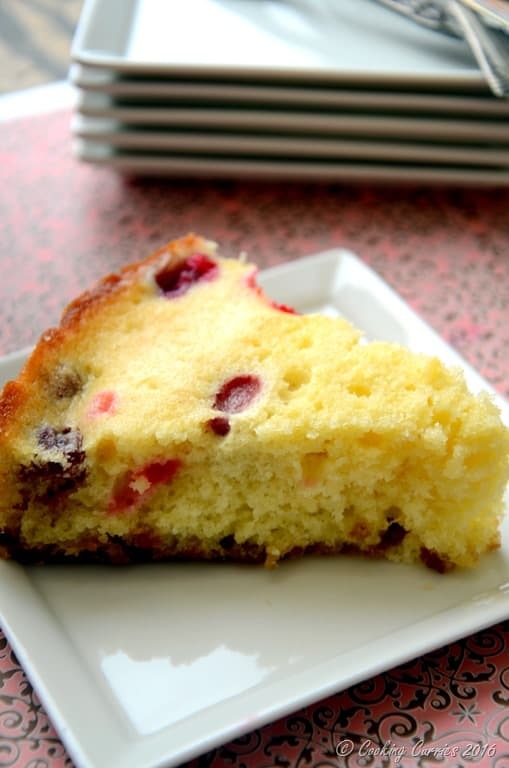 The tartness of the cranberry, the sugary buttery -ness of the glaze and the spongy cake in the middle of that…it is one heavenly mouthful! Go ahead, try it! 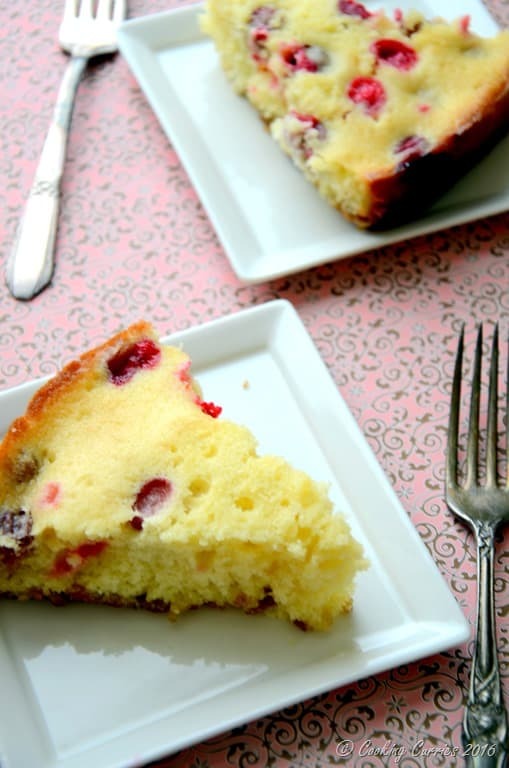 I adapted this recipe from Paula Deen’s Cranberry Upside Down Cake recipe. I obviously reduced the butter. The cake mix recipe is one of my own, from a chart that I had come up with, a few years ago, to make cake recipes on my own. It is a simple three step recipe. Make the glaze by melting the butter with the brown sugar. Pour into the pan and top with the nuts. 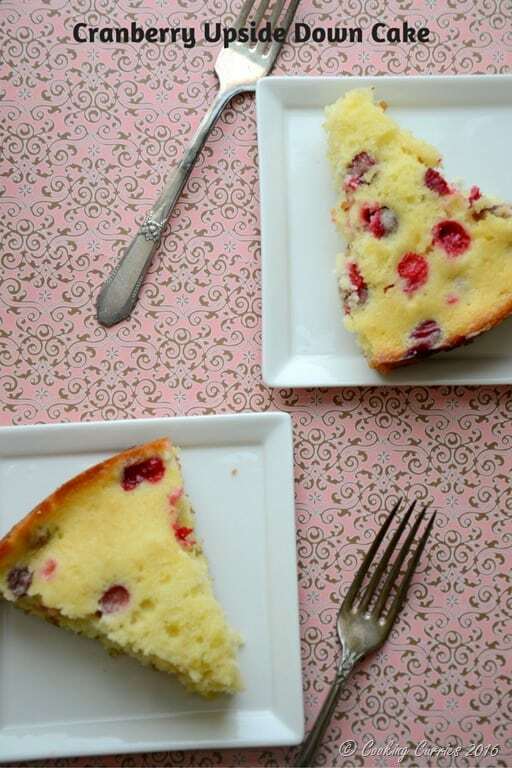 Make the cake batter and add the cranberries to it. Pour the cake batter over the nuts and glaze and bake. Turn it upside down and serve. 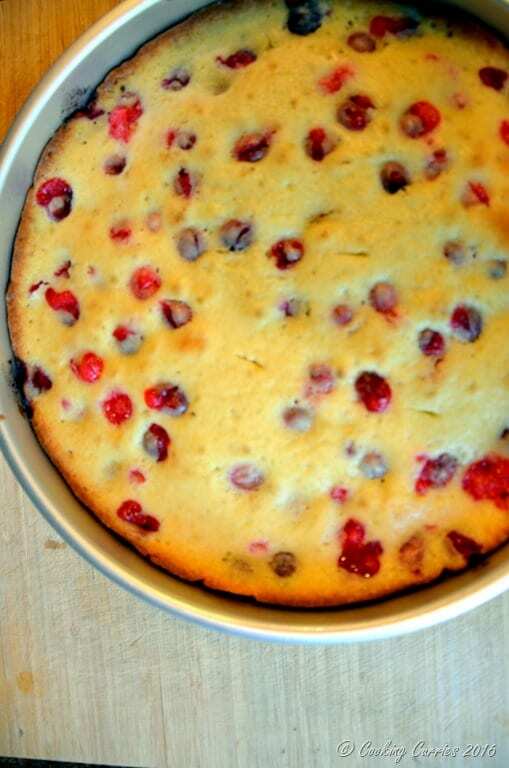 Though I liked the top part better..sprinkled with cranberries and all! See, how gorgeous that is! Preheat the oven to 350F. Spray a 10 inch baking pan with cooking spray and line with parchment paper. Spray again on top of the parchment paper. Heat the brown sugar and 1/2 stick butter in a saucepan till the butter melts. Pour this into the cake pan. Sprinkle the chopped nuts over it. Combine the flour, baking powder and salt and keep aside. Measure out the milk and keep aside. Beat the remaining 1 stick butter with the granulated sugar until fluffy. Now add the vanilla and eggs to it and beat well. Alternatively add the flour mixture and the milk to this while continuing to beat, starting and ending with the flour mixture. Add the cranberries to it and pour the mixture into the pan with the butter, sugar and nuts. Bake in the oven for about 35 mins or until a knife comes out clean when inserted. Cool the cake in the pan for 10 mins or so and invert the cake onto a serving platter. Cut and serve! Beat the remaining 1 stick butter with the granulated sugar until fluffy. Now add the vanilla and eggs to it and beat well. Alternatingly add the flour mixture and the milk to this while continuing to beat, starting and ending with the flour mixture.